Description: In the past century, Asian nations have experienced a wave of democratisation as countries in the region have gained independence or transitioned from authoritarian military rule towards more participatory politics. At the same time, there has been an expansion of judicial power in Asia, whereby new courts or empowered old ones emerge as independent constraints on governmental authority. "Courts and Elections in Asia"
In the past century, as the winds of political change swept across the globe, Asian nations too experienced a wave of democratisation as countries in the region gained independence or transitioned from authoritarian military rule towards more participatory politics. In tandem with this democratisation trend, we may also witness a concomitant expansion of judicial power in Asia, whereby new courts or empowered old ones emerge as independent constraints on governmental authority. The rise of the courts, and the accompanying ‘judicialisation of politics’, is as much an Asian phenomenon, as it is a prevalent trend in the West. There is now a rich corpus of literature on how Asian courts have participated in and even reshaped the human rights discourse in their respective jurisdictions. 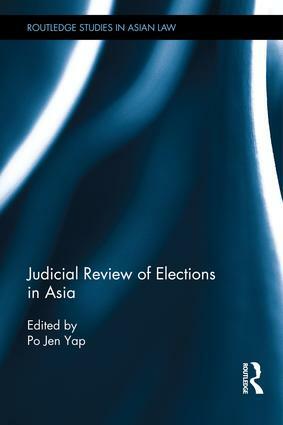 However, little academic literature has examined how Asian courts have responded to deficiencies in the electoral processes and the concomitant problem of partisan self-dealing. Specifically, partisan self-dealing occurs when the political actors devise electoral rules that govern voting, political parties, electoral boundaries, apportionment, the administration of elections, and campaign finance that are designed to entrench themselves in power. The purpose of this book is to redress this gap in the scholarship by exploring how courts in Asia have addressed this central challenge to democratic governance. "Judicial review of elections in Hong Kong: Resolving a contradiction"
The judicial review of elections in Hong Kong is a relatively recent phenomenon. It occurs in a unique milieu of entrenched political rights and political institutions that are on an evolving course to becoming fully democratic. In this milieu, a contradiction has become apparent; while Hong Kong courts are prepared to strike down unreasonable restrictions on voting and candidacy, sometimes with significant consequences, they have done very little to impact the most unfair and illegitimate aspects of Hong Kong’s electoral systems. These aspects include the functional constituencies that have returned at least half of all legislators since 1985, the 1200 member election committee that nominates and elects the chief executive, and the practice of corporate voting used in both the election committee and functional constituency elections. "Judicial review of the electoral process in Singapore after Vellama"
Vellama d/o Marie Muthu v. Attorney General remains the first and the only occasion where the Singapore judiciary had the opportunity to review a challenge to the local electoral process. Specifically, the Singapore Court of Appeal held that the Prime Minister had a constitutional duty under Article 492 of the Constitution to call for a by-election when a casual vacancy arose. But, on the facts, the Court of Appeal also held that the applicant, a resident voter of the Hougang Single Member Constituency (SMC), had no standing to seek declaratory relief from the courts after a by-election to fill the vacancy at Hougang SMC had been carried out, and she thus incurred no ‘special damage’ after that to seek judicial relief. The facts and the procedural history of the case may be briefly stated. Following the vacancy of the Parliamentary Hougang SMC on 14 February 2012, a resident voter of the said SMC instituted judicial review proceedings for a mandatory order requiring the Prime Minister to advise the President to issue a writ of election for Hougang SMC and a declaration on the proper construction on Article 49 of the Constitution. On 2 March 2012, the Prime Minister announced that he intended to call for a by-election in Hougang SMC but had not decided on a time. On 3 April 2012, the High Court granted the applicant leave for a judicial review hearing. The by-election was subsequently held on 26 May 2012. The High Court dismissed the applicant’s case on 1 August 2012 and the Court of Appeal dismissed her appeal on 5 July 2013.